Bits & Scraps Of My Life: Got my mojo risnnnnnnnn!!! Oh my gosh....what darn song is that from????? UGH!!!!! I'm thinkin it's something from "The Doors" . But I am stumped......thats a bit before my time anyway....hang on a sec...this is why we have google!!!! Ok, where was I? Ummmm, no clue.......so lets start this over again. Hope you are having a GREAT saturday!!! It's obviously a pretty good day here.....I swear I am NOT dopin.....LOL. Just got in from dropping Jacob off at his g/f's house. She lives with her older brother and Jacob is really trying to make some brownie points with him so he is over at her house doing yard work.....LOL. Almost makes me wish I had girls.....can you imagine all of the free labor I'd have? Granted I do ahve all boys but they whine and complain about doing stuff here......but at a girls house they are workhorses I tell ya!! LOL. So we all sat and caught up a bit and then he had to head back home. It was really a great visit!! Ok...now back to my mojo risin!!! I got a couple of scrappy challenges put away last night!!! GO ME!!! LOVE your layouts...stunning my friend! You are one very talented lady! Thanks for your visit, sweet comment and for being one of my faithful Soul Fillers. Go you! Great job. How about you send me some of your mojo cause mine ran away with the spoon. Tina... you totally rocked our Thanksgiving challenge!! I adore the way you did the title... and your clustering skills are lookin' pretty darn good!! Love everything about this LO! Great layouts. I really like the colors and title work on the thankful one. Thanks for playing along with us at Frosted Designs. Such fun layouts! 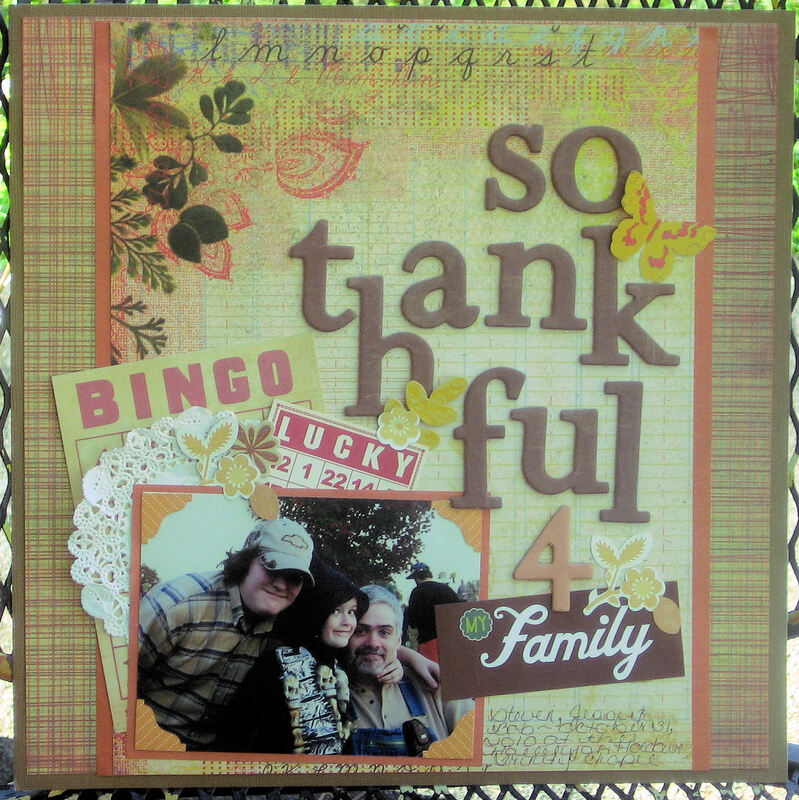 I love your Ninja style, and your thankful layout rocks. Thanks for playing along at Frosted Designs! Great stars on that Ninja layout...I'm a sucker for stars! And thanks for playing along with us at Twisted Sketches...you've been a busy girl and I'm glad to hear your mojo is getting a good work out! Love that sketch too!! Your layering and clustering skills are wicked awesome!! Thank you so much for sharing this with us at Paper Issues!! great layouts, come over this weekend so I can grab some mojo!! Thanks for linking me to some goodies to get me jump started today!